Olentangy Berlin’s Johnny Spinner (21) finds some running room during the second half of Friday’s season opener against visiting Briggs. New Program? What new program? The Olentangy Berlin football team certainly didn’t look like a group with almost no varsity experience to speak of — without a senior to speak of — in Friday’s season opener against visiting Briggs. The Bears looked solid, rolling to a 53-22 win. Johnny Spinner, who had four touchdowns and 127 yards on the ground in the first half alone, finished with five TDs and 237 yards when all was said and done. Berlin led 40-14 at the break. Joshua Gainey gave the Bruins some life, scoring from 57 yards out early in the third, but Spinner’s fifth score came on the ensuing drive to all but seal the deal. Berlin’s Nick Tiberio got in on the act several minutes later, scoring from eight yards out with 3:35 left in the third to account for the final margin. Jacob Moeller was pretty efficient for the Bears behind center, completing seven of his 14 passes, including two touchdown strikes to Corey Hill. Braden Cook anchored the Bears’ defense with 2.5 sacks. Robbie Dayhuff and Mark Roberts combined for 267 rushing yards and three touchdowns to lead the Pioneers to a season-opening win over the visiting Wolves Friday in Lewis Center. They played huge roles … as did PATs. Kilbourne’s Elijah Young scored what looked to be a game-tying touchdown — running in from 12 yards out with 3:57 left in the third quarter — but the Wolves missed the extra point. With the Pioneers clinging to a 21-20 lead midway though the fourth, Dayhuff found the end zone from seven yards out, but the extra point was no good, leaving the door open for the Wolves. Kilbourne was quick to take advantage of the opportunity, pulling to within one — 27-26 as Grayson Timms threw a touchdown pass to Sam English with 3:05 to go — but, again, the PAT was no good. The Wolves went for two, but the Pioneer defense stuffed Caleb Andrick before he could cross the goal line. That, as it turned out, was the difference. Dayhuff completed six of his seven passes for 58 yards and a touchdown. He also ran for 141 yards and a couple scores. Roberts, meanwhile, finished with 126 yards rushing to go with a touchdown. His one reception, a 10-yard strike from Dayhuff, was good for a TD as well. In a game that couldn’t have been more different than last year’s 3-0 showdown, the result was ultimately the same: a Johnstown win. Big Walnut got to within five — 43-38 with 4:11 left — thanks to a 62-yard scoring strike from sophomore quarterback Jagger Barnett to Craig Norman, but that was as close as it would get. The Johnnies scored the first 21 points of the game before Nathan Lawyer punched one in from two yards out with 7:31 left in the second quarter. Tyler Crotinger added another second-quarter score for the Eagles, Lawyer powered in from three yards out to make it a 29-21 game early in the third and, after a field goal got them even closer, Barnett found Nathan Montgomery from 53 yards out to give his team a 31-29 lead with 2:24 left in the third. Johnstown, though, scored the next 15 points to take control and ultimately hold on. The Liberty offense never quite found its form as the Patriots dropped Friday’s season opener in Pickerington. North held Liberty to just 126 yards of total offense after starting quarterback Mitchell Okuley went down with an injury early in the game. The senior threw just three passes. Still, the defense kept things interesting, giving up just a pair of Michael Lowery touchdown passes, one in the first quarter and another in the third, before Tanner Pope booted a 37-yard field goal midway through the fourth to smooth out the scoring summary. Backup quarterback Corbin Parrish completed nine of his 21 attempts for 82 yards and a pair of interceptions for Liberty while Aidan Kenley led the Patriots with 44 yards rushing. 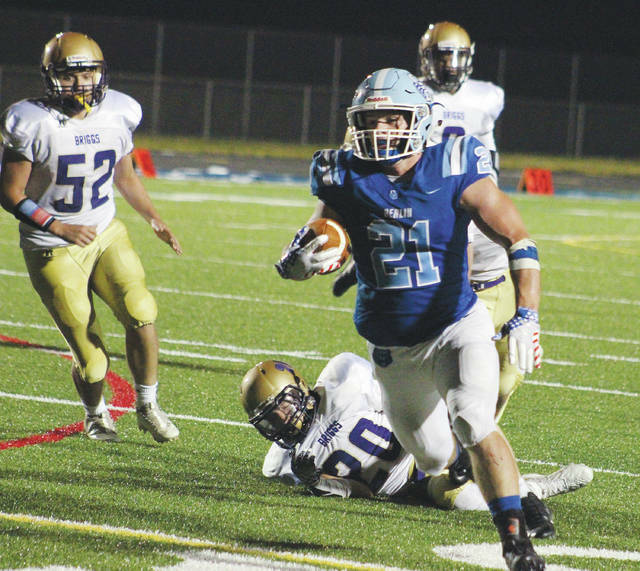 Connor Haag threw a pair of touchdown passes, but Olentangy couldn’t overcome a nine-point deficit in a loss to Darby Friday in Lewis Center. Haag converted a 20-yard touchdown pass to Ian Drummond on fourth-and-15 in the fourth quarter to get the Braves close. He also had a 21-yard touchdown pass to Caden Kaiser in the second quarter to get Olentangy on the board.